The Ely Stage Stop and Country Museum in Kelseyville hosts the next First Sunday of the Month Fiddlers Jam on September 7th. Although there will be fiddlers galore, you might also find some guitars, a bass, a mandolin, an accordion, an autoharp, or even a drummer. It’s always a surprise who shows up to play. Celebrating Americana music, you will be treated to “old timey” tunes and some sing-alongs. Last month attendees were treated to some fast-paced zydeco. Come ready to clap your hands, tap your toes, and get up and dance! 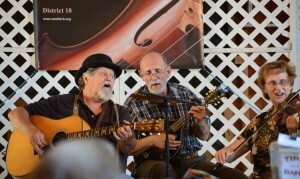 As always, the fun begins at the museum at 11:00 a.m. with the Fiddlers playing in the barn from 12 noon through 2 p.m. Donations benefit the Ely Stage Stop and the Old Time Fiddlers Association. This free, family friendly event can be enjoyed by all, young and old alike. Come early to enjoy all of the latest museum acquisitions and displays. Bring a picnic lunch to enjoy on one of our beautiful picnic tables. Buy tickets for the next table to be raffled off and also for a surprise basket to be raffled during the fiddling that day. Enjoy the music with beverages and tasty treats provided by the docents. Bring your own wine and sip it in Ely Stage Stop wine glasses that are available for purchase. Ely Stage Stop – best kept secret in Lake County? This past weekend I discovered what has to be one of the best kept secrets in Lake County and that is the Fiddlers’ Jam at the Ely Stage Stop. I had heard about it in the past but had not attended before and boy was I surprised by what I found when I got there. First, when I got to the stage stop I was transported to another place in time. I felt like I was in the middle of nowhere when actually I was just off Soda Bay Road less than a mile from Highway 29 and Kit’s Corner. I drove up the driveway to the main building and found myself surrounded by old (antique?) farm implements which immediately transported me back in time. All the machinery is fascinating and there is even an authentic San Francisco cable car there. And a real stage coach too. How cool is that?! So anyway, I parked in the shade under the oak trees and walked across to this big old red barn – with a very modern quilt square on the front. I found out that the barn isn’t really old at all but rather that volunteers built it of wood from barns that were old and it has only been there for a year or so. There was music coming out of the barn and the fiddlers were inside. I said fiddlers and that’s what I expected to find but while there were several fiddlers that day there were also some guitars, a bass player, a mandolin, an accordion, and an autoharp or zither, and a drummer. I recognized some of the musicians from the Lake County Symphony but there were also some with white hair and one of the fiddlers was a young girl who looked like she wasn’t even 10 years old yet. They played music that ranged from “old timey” (as their leader, a man named Don Coffin, put it) tunes to Zydeco to songs everyone knew the words to. People were singing and dancing and there was magic in the air. There were also free cold drinks and homemade cookies. I couldn’t believe all of this has going on for months now and I hadn’t been there before. I can assure you I will be there again – and again after that. And I encourage everyone who reads this to go check it out for an exceptionally good time on a Sunday afternoon. And then – as if the music and magic in the barn weren’t enough – the main building houses a museum of local history with a gorgeous old-time bar and some really cool exhibits. Plus a big wraparound porch with comfy chairs and binoculars for a close-up view of the backside of Mt. Konocti. I can’t say enough good things about this treasure that I found that has been here all along without my really knowing anything about it. I had such a good time that I felt compelled to shout it from the rooftops (so to speak) and let everyone else know about it too. I hope you go visit this treasure as soon as you can and that your time there is as much fun and as joyful as mine was.